On June 8, 1966, while the main focus of pro football followers was on the announcement of the AFL-NFL merger, the Philadelphia Eagles parted ways with Pro Bowl CB Irv Cross, who was sent to the Los Angeles Rams for DB Aaron Martin and HB/flanker Willie Brown. It was the second trade by the Eagles to the Rams of a disgruntled defensive Pro Bowler during the turbulent offseason as discontent rose against Head Coach/GM Joe Kuharich. LB Maxie Baughan’s demand to be sent elsewhere was accommodated several weeks earlier. The 26-year-old Cross had been with the Eagles for five seasons, but threatened to quit unless traded. Drafted by the Eagles in the seventh round out of Northwestern in 1961, Cross was thrust into the starting lineup when star CB Tom Brookshier suffered a broken leg in the eighth game. He intercepted two passes, recovered two fumbles, and suffered three concussions during the season. Cross remained in the starting lineup in 1962 and showed improvement as he intercepted five passes. By 1964, he was chosen to the Pro Bowl for the first of two consecutive seasons and was noted for his tackling ability as well as coverage skills. Thus far with the Eagles, he had intercepted 15 passes, one of which he returned for a 94-yard touchdown. He also was Philadelphia’s primary kick returner in ’65, running back 25 kickoffs for a 26.5-yard average and 14 punts at a 5.6-yard rate. As for the players the Eagles received for Cross, Willie Brown was 24 and a third-year player who was drafted by the Rams in the third round in 1964 out of USC. He had primarily been used to return kicks and, as a halfback, rushed for 133 yards on 44 carries in ‘65. The Eagles had hopes of using him as a flanker. Aaron Martin, also 24, went undrafted out of North Carolina College and was signed by the Dallas Cowboys in 1964, who tried him on offense, but was released during the preseason after which the Rams picked him up. He started the ’65 season at cornerback and intercepted two passes before suffering a broken left arm in the fourth game that sidelined him for the remainder of the year. The Rams, coming off of a 4-10 record (their seventh straight losing season) had a new head coach in the defense-minded George Allen, formerly an assistant under George Halas with the Bears (who did not let him go without a court battle). Allen inherited an excellent defensive line but the remainder of the unit needed bolstering. The addition of Baughan at outside linebacker was a plus and it was hoped that Cross could help in a defensive backfield that had one star in FS Ed Meador and inexperienced players at the other positions. Cross proved to be a good fit at right cornerback for the Rams, who improved to 8-6 in their first year under Coach Allen. He paired up well with young CB Clancy Williams on the other side and, while he intercepted only one pass, he returned it 60 yards for a touchdown, and continued to impress with his tackling. Cross was with Los Angeles for three seasons, and with the outstanding defense leading the way, the Rams went 11-1-2 in 1967, reaching the postseason for the first time since 1955, and 10-3-1 in ’68. He intercepted a total of six passes and was also used to return kicks, averaging 7.5 yards running back 29 punts and 30.1 yards on 16 kickoff returns. 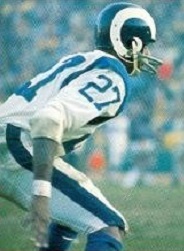 Cross was traded back to the Eagles in 1969 in the deal that brought All-Pro OT Bob Brown to LA. He was a player/coach in his final season, and after retiring as a player was an assistant coach in 1970 before moving to the broadcast booth. He became a fixture on "The NFL Today" on CBS from 1975 to ’89. As for the Eagles, the result of the transaction was disappointing. Willie Brown lasted one year with the club, catching no passes and returning a handful of kicks with mediocre results. Aaron Martin spent two seasons with Philadelphia, intercepted two passes and returned a punt for a touchdown, but was nothing special in the defensive backfield.